We have expanded! Axxis is excited to announce the opening of our second US warehouse, located in the suburbs of Chicago, IL. Our new location offers modern, expansive space, and is strategically located to better service our Distributors. Klinch-Pak offers the widest range of Tools and Fasteners in the industry. Klinch-Pak offers the most extensive Bostitch® type tools and fasteners in the industry. Our staples are designed to interchange seamlessly with your existing tool populations, making conversions simple. We offer Stick, Roll (1M & 4M), Plier, and Jumbo type staples for Bostitch® tools. Our Klinch-Pak tools are able to accept both genuine Klinch-Pak and Bostitch® fasteners, making them an easy substitution. We offer plier staplers, manual and pneumatic stick staplers, roll staplers, and jumbo staplers. ITo meet the recent demand, we have added new Duo-Fast series staples to our Complete line. To give you an alternative source, we are stocking the Duo-Fast type 18 ga, 16 ga, 15 ga, fine wire staples, along with brads and finish nails. Below is a quick overview of the new series we have added. Attached you will find the full list of individual sizes in stock. Please call your rep for pricing details. All boxes include a revamped design and label, perfect for dealers. Introducing 2 new Hog Ring Tools to our line. The DR201 and DR203 Hog Ring Tools use the C-SR15 3/4” D rings. We offer two magazine options: standard (DR201) and double length (DR203) to accommodate your varying applications. The magazine rotates/swivels 360° to make tool placement easier for tighter applications. The DR201 can hold 60 rings, and weighs 2.97lbs. The DR203 can hold 100 rings, and weighs 3.15lbs. These tools are designed for bedding & spring mattresses, automotive seating, furniture, bag closure, poultry cages, and fencing. Tools and parts are in stock. We are pleased to introduce new staplers for the K-590 series staples. We are offering 2 configurations; the KP-35T-590 plier stapler, and KP-35-590W stapler with walking stick. Both models are designed to handle all your heavy duty corrugate stapling needs. The K-590 series staples are a specially designed flat wire to eliminate tearing through the corrugate material. The CN-565Z 0° Siding Nailers are tough, reliable and are a competitively priced options for your nailing needs. The tool features a depth of drive dial to easily adjust depending on the application. The bump fire trigger allows for rapid production, driving 6-7 nails per second. The magazine holds 300 plastic collated nails, and is easy to load. The rubber grip will help cut down on user fatigue, and the no mar rubber pad will help protect the material being fired into. The CN-565Z is the perfect tool for all your siding, fencing and sheathing options. Introducing the Apach 16 Ga. Wide Crown Staplers. We are offering 3 models for the Senco/Duo-Fast, Bostitch, and Paslode type 16 Ga Wide Crown Staples. A perfect replacement for many of the discontinued models. Klinch-Pak offers the widest range of Carton and Plier tools in the industry. Introducing the Axxis Pneumatics NRH‐83 Framing Nailer - the classic design the market loves and demands. Our NRH‐83 is designed to shoot 21 or 22 degree full round head plastic strip nails. It accepts 2” to 3‐1/2” length nails, while only weighing 8 pounds. Nailers and Staplers for installing roofing, siding, and insulation. Complete hammer tackers are perfect for Insulation, Roofing Felt and Housing Wrap. We offer 5 tools for the most common staple types to interchange with Arrow, Bostitch, and Duo-Fast type tools. Apach nailers and staplers are the preferred choice for roofing, siding and vinyl siding installation. The Vinyl Fast tools offer a uniquely designed nose to make installing vinyl siding simple. 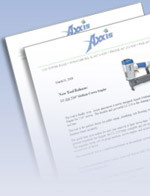 Axxis – Now Offers Access to Bostitch Packaging Products. Our specialty tool offering is unmatched. The U‐Crown, Hog Ring and Flooring Staplers are among some of the new favorites. Klinch-Pak announces the new Ergo line of Carton Closing Staplers. Tools feature a lightweight composite upper body, with a durable magnesium lower body. Klinch-Pak announces the release of The Classic Carton Closing Staplers. Tool Comparison for KP and JK Plier Staplers. Klinch-Pak Plier Staplers Marketing Spotlight. Introducing Apach's new PT-635 Headless Pinner. The PT-635 accepts 1/2" to 1-3/8" Headless and Mini Pins. This tool will soon be replacing the PN-630. Klinch-Pak is now stocking a full range of Stitching Wire. Our Carton Closing Tools do it all. New Klinch-Pak products for 2011. Apach Updates its premier Tool, the CN-70E2 with new a design for the Driver Blades, Piston assemblies and Bumpers.